Global ratings agencies Standard & Poor’s and Moody’s have effectively put the new Turnbull government on notice to reduce the nation’s budget deficit or risk a downgrade in Australia’s credit rating. Sounds serious, but what does it actually mean and is it necessarily a bad thing? Australia is one of only three members of the Group of 20 (G20) leading industrial nations with a AAA rating, the others are Canada and Germany. With the government still lacking a majority in the Senate, both ratings agencies cited parliamentary gridlock as their main concern, along with rising levels of national and household debt. Without a clear majority in the Senate, they argue, the government will find it difficult to get its spending cuts and other budgetary measures passed by the upper house. Standard and Poor’s has changed Australia’s credit outlook to ‘negative’ and says it will keep a close eye on Parliament and its efforts to narrow the budget deficit over the next six to 12 months before downgrading Australia’s AAA credit rating. Moody’s has adopted a less formal wait and see approach. A AAA (or Triple-A) rating indicates to lenders that the government or institution so rated is highly likely to repay their loans. The three main global ratings agencies – S&P, Moody’s and Fitch – have similar grades, with AAA the highest and C the lowest. Anything below BB is considered ‘junk’. Ratings are determined after looking at things such as assets, liabilities, income and expenditure. Like households, governments can improve their budget position by cutting spending and paying down debt. But unlike households, governments can also raise taxes and print money to boost their coffers. The main benefit of a high credit rating is the ability to borrow at lower rates of interest because we are seen as low risk; the main way governments borrow money is by issuing bonds. But to maintain the highest rating governments must keep a lid on debt. Australia’s debt is currently around 15 per cent of GDP. If we were to lose our AAA rating, the government would have to pay slightly higher rates of interest on bonds it issues in future. The higher our national debt, the more the government pays out in interest. A ratings downgrade could have flow-on effects for the Big Four banks which also had their outlook cut to ‘negative’. This is because the banks’ AA- credit rating is linked to the government’s high rating and the implicit understanding that it would support the banks in a crisis. Like the government, the banks could also end up paying higher rates of interest to global bond investors who are a major source of bank funds. While this might be good for bond investors, an increase in the banks’ funding costs may not be so good for local borrowers who could end up paying more for their loans. The ratings agencies themselves suffered a downgrade in public opinion for the role they played in the GFC. In the lead-up to the crisis they gave AAA ratings to complex financial products based on US mortgages. When house prices fell and borrowers defaulted, many of these highly-rated products also went into default leaving investors empty-handed. The performance of the agencies is a little better when it comes to assessing government risk, but even then the warnings often come after the event. The recent downgrade of the UK government’s credit rating after the Brexit vote arguably only stated the obvious – that the outlook for the British economy is less rosy after the vote than before. 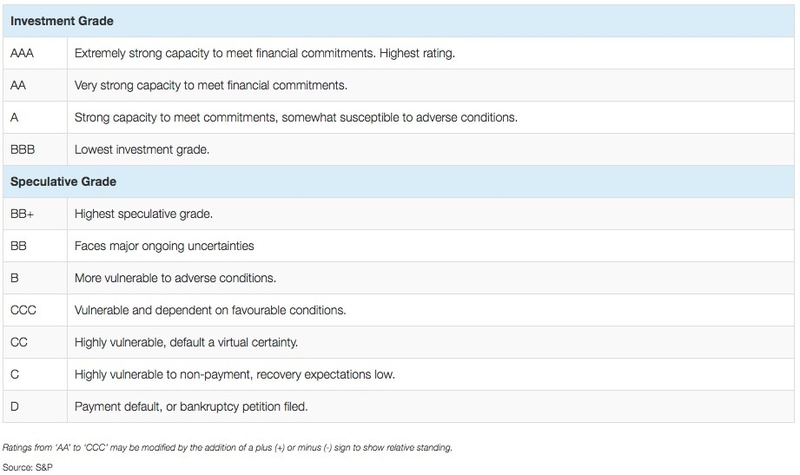 The Australian government also faces challenges, but a rating downgrade is not necessarily one of them. The composition of the newly-elected Senate could make it difficult for the government to achieve budget cuts or balance the budget by 2021, while weak commodity prices will reduce projected revenues. The May budget targets were based on an iron ore price of US$60 a tonne, but the Government recently reduced its iron ore price forecast for 2017 to US$44 a tonne. In this environment, most economists expect the Reserve Bank to cut interest rates to stimulate economic growth. In practice, it is the Reserve Bank that has the biggest influence on domestic interest rates, not ratings agencies. The interest rate on Australian government bonds is currently around 2 per cent and falling, along with rates around the world. While low interest rates are bad news for savers and anyone who relies on income from their investments, there is a silver lining. Low rates make it easier for the Australian government to pay down debt and lock in finance for investments that benefit the nation. While the warning of a credit downgrade focuses attention on the job ahead, it is unlikely to have a material impact.